Expensive haute cuisine restaurants are common as muck in Mayfair. They’re plastered all over the place and many (but by no means all) are so blandly uniform that you could quite easily stagger from one to the other on some sort of tasting menu bender without knowing where you are. The receipts, once you’d recovered from sticker shock, would be the only way to tell where you had been. That and which brand of scented handwash was used in the bathrooms or which initialled napkins your miscreant dining companions had nicked. Murger Hanhan is one of the few standout restaurants in this otherwise sea of moneyed conformity. 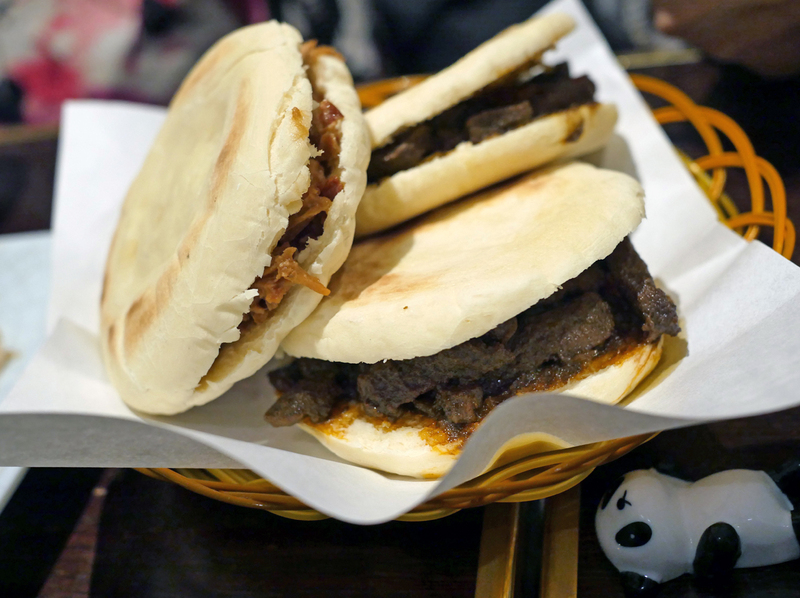 This small, casual yet clubby-feeling restaurant is one of a growing number in London serving Xi’an cuisine (or, if you prefer, Shaanxi cuisine) and is a sequel to Murger Han near Euston. Murger Hanhan’s brusquely efficient Chinatown-style service won’t suit everyone, but I’ll gladly take it over brusque yet maddeningly slow service or just plain finger-drummingly inefficient service. Even so, it’s definitely worth tolerating the terse service and somewhat cramped quarters – there are some unexpected pleasures to be had at Murger Hanhan. The odd term ‘murgers’ appears to be management’s attempt at an easy-to-pronounce name for roujiamo, a meat sandwich that’s superficially similar to a burger. The sandwiches themselves also left much to be desired. The pork version saw reasonably moist shreds of pork reformed into a quasi-patty, but its dull flavour made for monotonous eating. 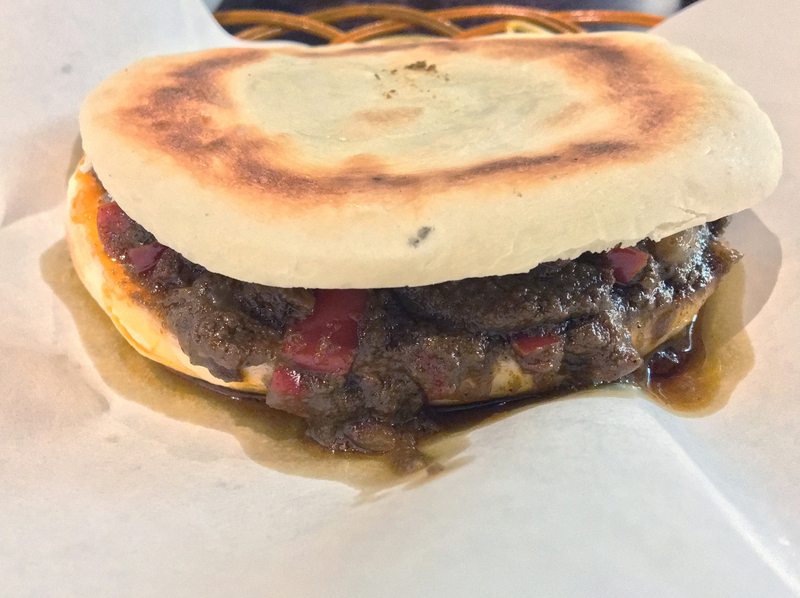 The beef was somewhat better as its meatier filling came blessed with a spicy pepperiness, but it was also a tad too oily. The thin flatbread used in both types of murger yoyo’d in quality, ranging from unpleasantly cardboard-like in its stiffness to a softer, less offensive version. Neither version of the bread was especially adept at soaking up the oil and sauce of the filling and thus preventing them from dribbling everywhere. Unimpressive. Other people can drive you to murger. 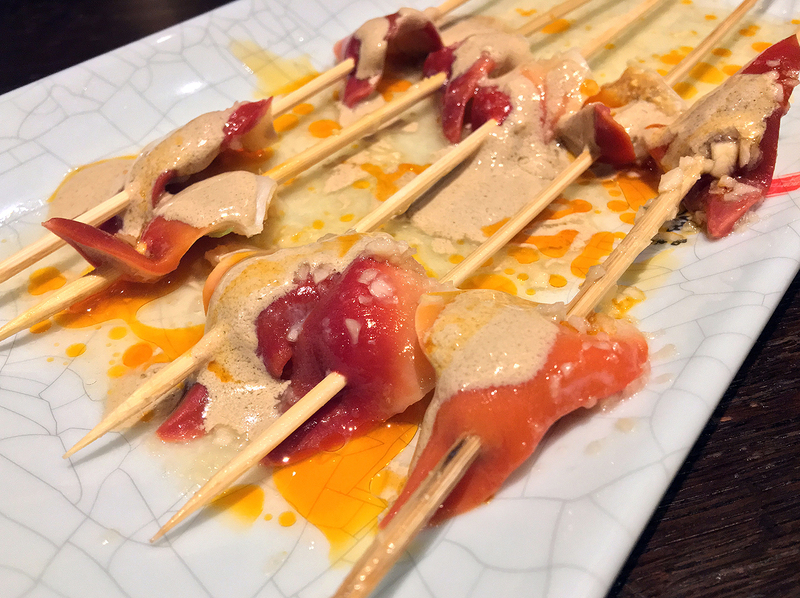 All of the skewered starters at Murger Hanhan came slathered in a pair of sauces. One was a fairly bog-standard chilli oil, while the other a surprisingly creamy satay-ish condiment. More work is clearly needed, as all of the skewers were enjoyable enough with or without either sauce. Wrinkly, dimpled tripe was a tad overcooked, but thankfully not enough to completely detract from its textural charms. 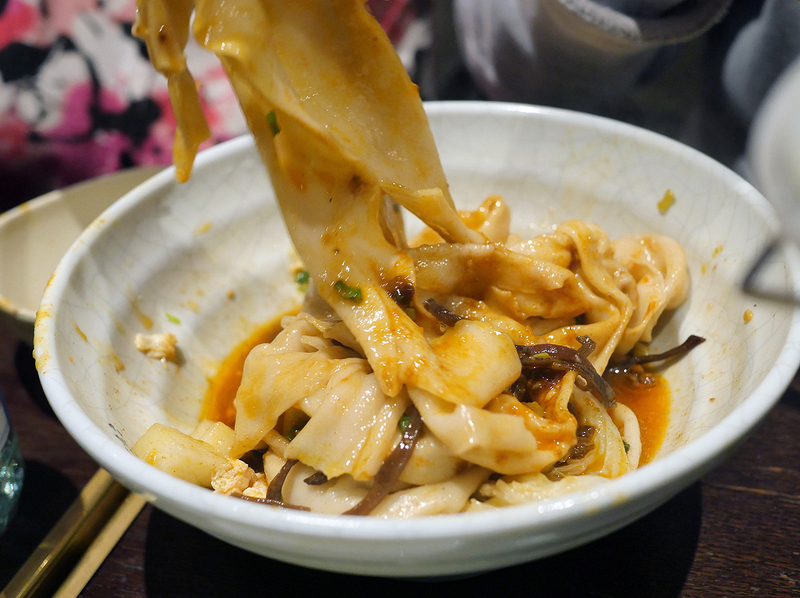 Long sheathes of tofu replicated much of the tripe’s texture in a vegetarian-friendly form, interspersed with stretches of smoothness. Crimson-hued surf clams weren’t quite as springy and bouncy as I would’ve liked, but they weren’t a complete loss with just about enough firmness. If you aren’t as charmed by the panda chopstick holders as I am, then you’re going to need an intervention. Chilled rice noodles doesn’t sound appealing when the weather outside is frightful, but this starter-sized dish is worth having whatever the time of year. 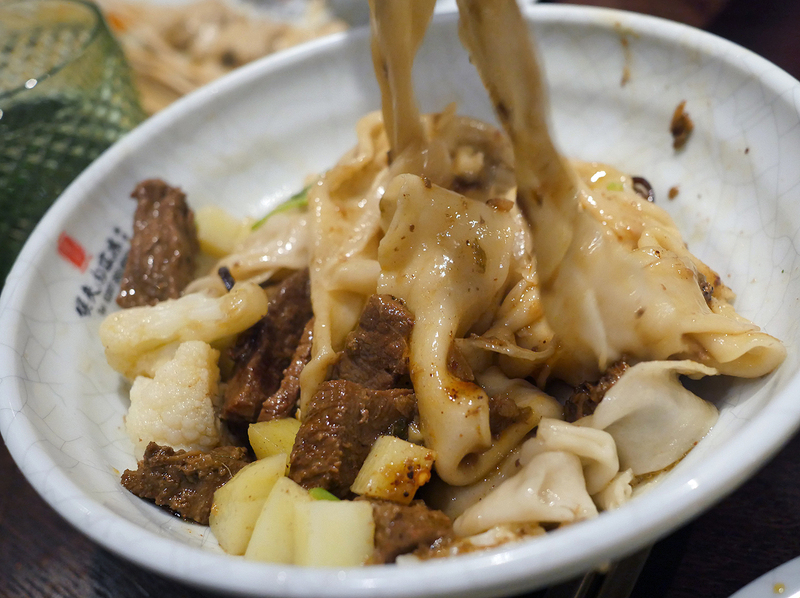 Narrow yet thick, supple and slippery, these chunky noodles were a textural delight. 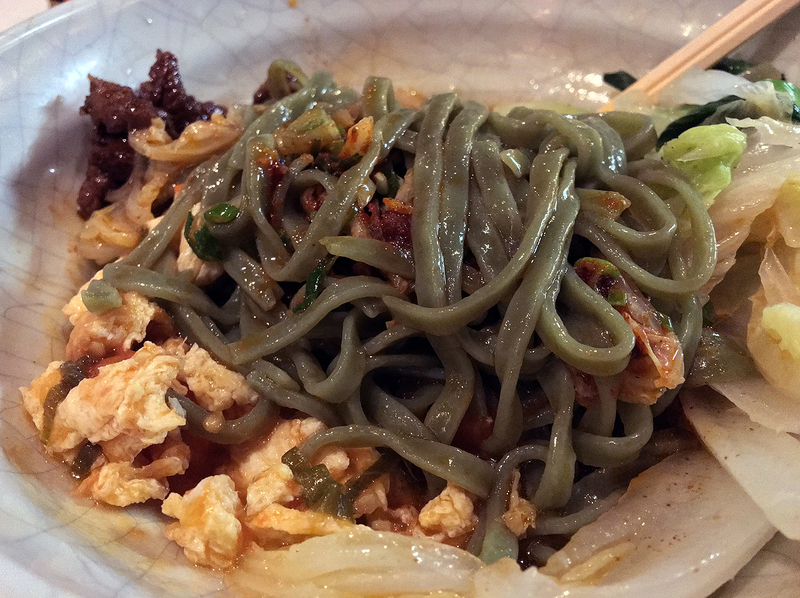 They didn’t just rely on their mouthfeel to win me over though – the tart, sour and lightly spicy sauce neatly boosted the noodles’ innate moreishness to winsome effect. The downstairs bar mostly seems to serve as a sort of staff canteen/drinking spot for the proprietors’ mates. An alternate version of this dish with chilled wheat noodles wasn’t quite as successful. Even though the sauce remained as lip-smacking as ever, the spongy and springy wheat noodles just weren’t as smooth, milky and moreishly satisfying as the rice noodles. Served with strips of processed gluten – pure kryptonite for all the psuedoscience loving anti-gluten fanatics out there. 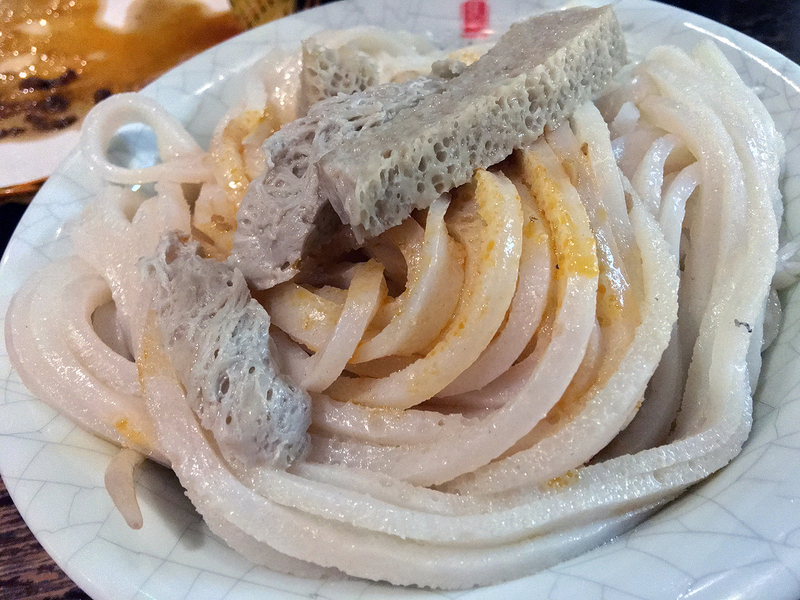 Thick, wide, smooth and slippery biang biang noodles are one of the main attractions at Murger Hanhan and their quality remained consistently high across multiple visits. The ‘basic’ version of this flagship dish isn’t compromised by its apparent simplicity – if anything, it emphasises just how good its fundamentals are. The superlative noodles were topped with crisp, peppery spring onions and a sweat-inducing chilli sauce. The crunch of the greens, the tingling heat and the addictively slurpable noodles all came together beautifully. Deceptively simple dishes like this are often one of the better ways to judge a kitchen’s prowess. Think of biang biang noodles as weaponised taglitatelle. If that helps you. A noodle topping of braised pork and an egg and tomato sauce was surprisingly dull. The oddly limp sauce was neither here nor there, while the mystery meat had little to say for itself – I wouldn’t have known it was pork if the menu hadn’t told me so. The heap of mashed ginger and spring onions made more of an impact than either the pork or the scrambled egg-like sauce. 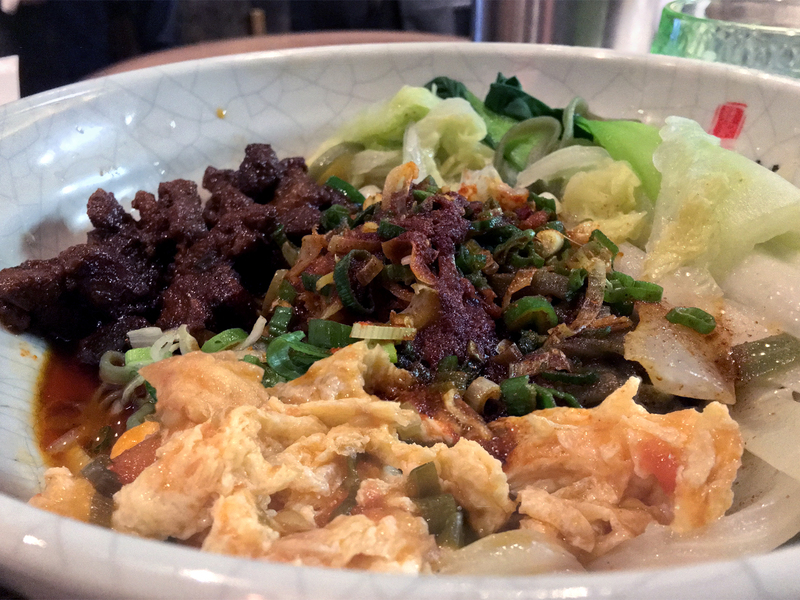 All this proved true whether they graced biang biang noodles or the narrow and moderately thick spinach noodles. Apart from their jaunty sylvan colour, the spinach noodles were otherwise little different from any other competently made wheat noodles I’ve ever had. 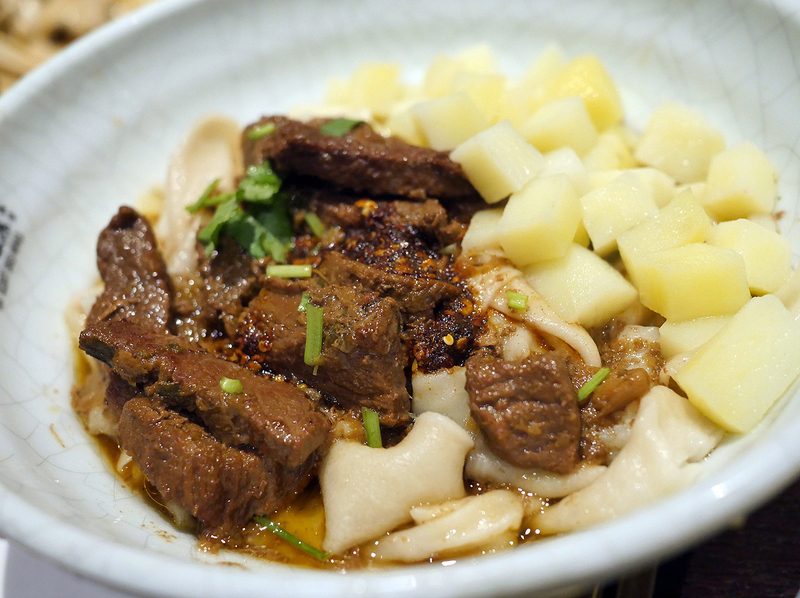 The ‘special’ beef dry noodles were a far better bet if you want biang biang noodles with some meaty embellishment. The dense, earthy slices of beef provided plenty of heft, while the sauce provided a sour heat that moisted my brow with sweat despite being only ‘medium’ strength. The cubed root veg felt a bit tacked on, but they did provide ballast if nothing else. Not your granddaddy’s beef and potatoes. Unless your granddaddy was from Xi’an, in which case fair enough. 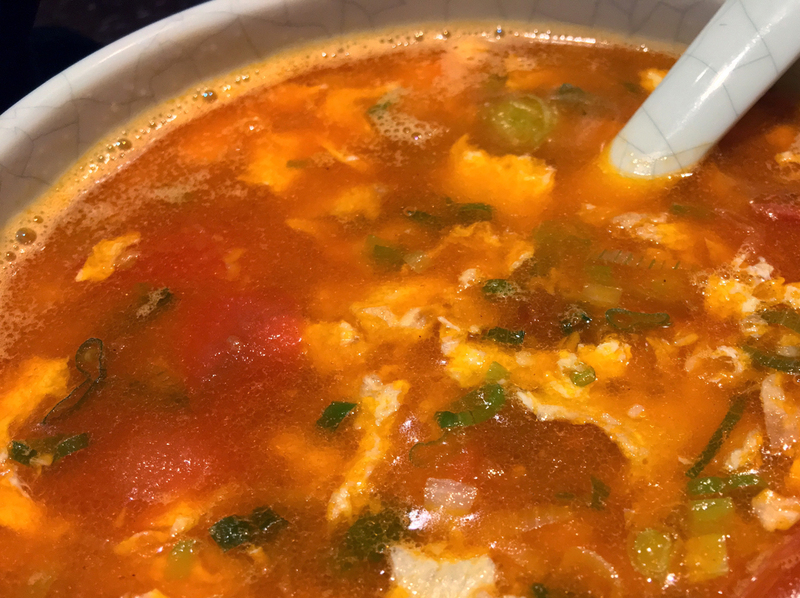 Order a bottle of the cold soya milk to go with any of the spicy dishes at Murger Hanhan. You’ll need its cool, refreshing qualities. If the dual carriageway width of the biang biang noodles aren’t broad enough for you, then you can always opt for the extra-wide noodles. Boiled with bok choy and served with an egg and tomato sauce on the side, these swaggering sheathes almost look more like wonton skins than noodles. To my surprise, the egg and tomato sauce was far more effective than the version that graced the standard biang biang noodles and the spinach noodles. More of a soup than a sauce – at least from a Western perspective – its umami, sweetness and heartiness proved to be a fine savoury fit for the toga-like noodles. The water the noodles had been boiled in had a mildly starchy quality. If you’re pathologically averse to waste, then you can drink it. The one noodle dish at Murger Hanhan that came close to displacing the biang biang noodles from my affections was a rather unexpected one. Thin, narrow rice noodles with rounded edges came in a clay pot, underneath which lay a world of unexpected delights. Noodle-like strips of dimpled tofu, nutty mushroom-like flecks of seitan, cubes of quivering milky tofu with a hearty bready crust, crisp bok choy and rich little quail eggs. A dollop of sweat-inducing fermented bean paste had hints of numbing Sichuan pepper and possibly cumin. The only way this intensely savoury cauldron could’ve been made better, as far as I could see, was with more dimpled tofu strips taking the place of the rice noodles. While the latter were decent enough, they just didn’t have the tantalising mouthfeel of the tofu strips. If you want a grown-up vegetarian dish confident enough in its own virtues to not imitate meat, or indeed have any need for it, then this is it. One of the best vegetarian dishes I’ve had in London and all I have to show for it is this single mediocre photo. 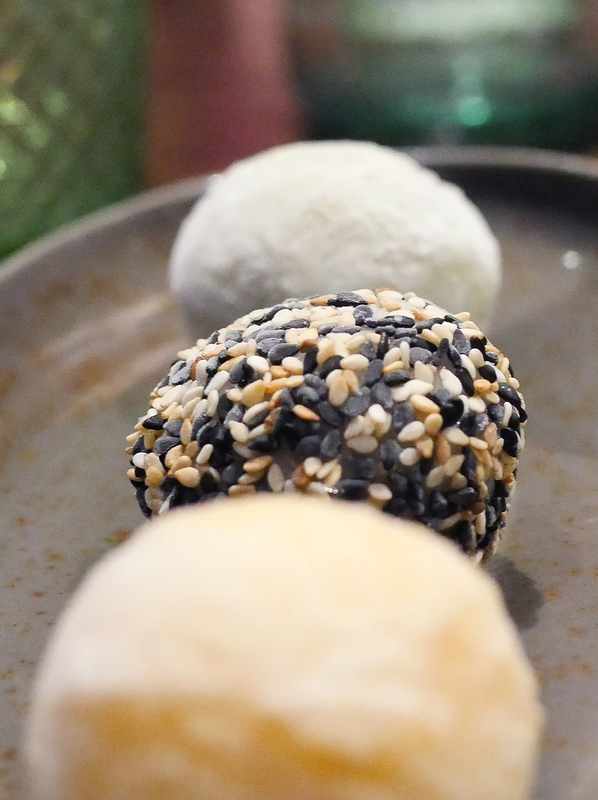 Desserts at Murger Hanhan are clearly an afterthought with brought-in mochi ice cream as your only choice. The mochi skins weren’t anywhere as elastic as I would’ve liked, while the black sesame flavour was surprisingly dull. The yuzu was reasonably evocative of the fruit though, while the green tea flavour had a pronounced bitterness. It’s heartening to see Shaanxi food take root in London from Xi’an Impression in Holloway to Xi’an Biang Biang Noodles in Spitalfields and now the Murger Han duology in Euston and Mayfair. At present, Murger Hanhan is more or less evenly matched against London’s other Shaanxi restaurants. The potential, however, for driving forwards the state of the art probably doesn’t like with Murger Hanhan. 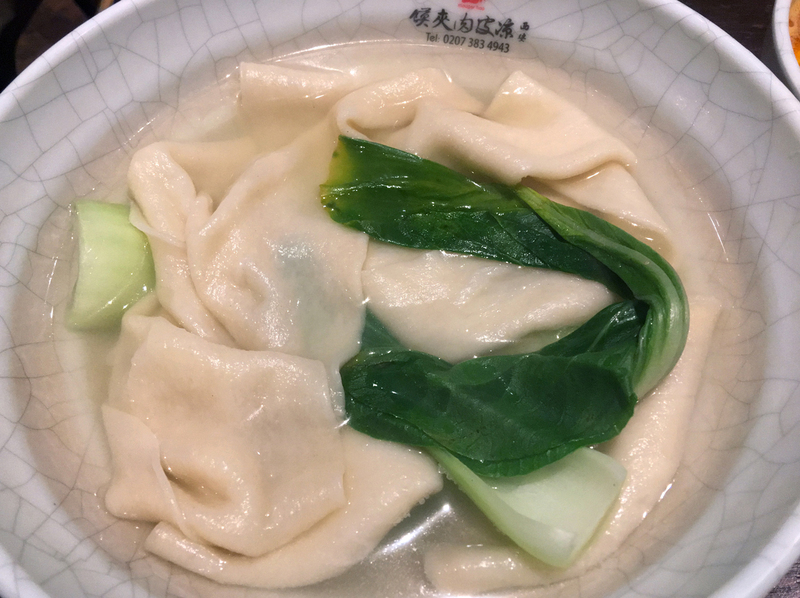 Not when it insists on devoting precious space on its short menu to filler like gyoza and edamame and dishes that tread water, such as the spinach noodles. Even so, I can’t help but like Murger Hanhan. 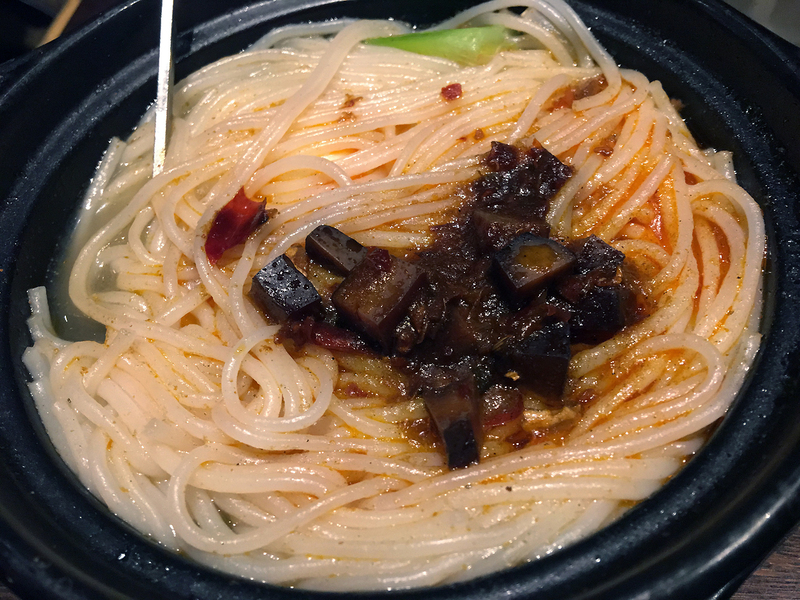 Its core noodle dishes are simply delicious, which makes for an experience that lingers long in the memory for all the right reasons. For this overly moneyed part of town, that’s a towering accomplishment in of itself. Opening Hours: seven days a week noon-22.00. Average cost for one person including soft drinks: £35 approx. Tags: beef, ice cream, london, mayfair, mochi, murger han, murger hanhan, noodles, pork, restaurant, review, xian biang biang noodles. Bookmark the permalink.